"Yours isn't even 1080p it’s a stretched 720i image!" "Yeah well at least mine runs at a constant 60fps, with real time particle physics!" "So what, you don’t even have anti aliasing shadows". At the dawn of a new console generation battle lines are quickly drawn up and the ensuing platform allegiances can spark furious internet arguments. Clearly to some the almost imperceptible differences between different versions of a game are worth getting angry about, but to those who don't study the game frame by frame they are more or less identical. It was different of course in the 16bit era when there were much more pronounced differences between the various machines that you could play your games on. But despite the varying strengths or weaknesses of the Mega Drive, Snes and home computers there were games that straddled all formats. Unlike today though, the games offered a very different experience from one platform to another. You may have been able to play a game on the Snes, Megadrive, Amiga, Atari ST, IBM PC, but apart from the title being the same, the game you played was often very different. This was partly because conversions from one system to another were often done by a team separate from the original creators, usually with little or no involvement from them at all. But a more significant reason for the version differences were due to the specifications of the system it was being ported to; its console architecture, capabilities and input device all distorting the game conversion for better or worse. Firstly you get ‘Conversions as Reflections’ - where the goal of the team creating the port is to replicate the original as faithfully as possible. This was the case with Doom, and Cannon Fodder on the Snes. The latter looked the same as the Amiga version and even had the same maps and graphics. But by maintaining the floating pointer method of controlling the characters it suffered on a system that had (for most) a controller as the primary input device. Next are ‘Conversions as Transplantations’ - where elements of an original game are lifted from one game and moved to another. Rainbow Bell Adventures is kind of an example of this (though it’s not a conversion). 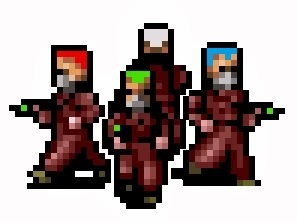 The characters of the shoot ‘em up have been moved to a platform game, carrying with them a similar graphical style, similar music and similar narrative. Other Snes examples could be Pac Attack or Bust a Move - familiar characters, different game style. The final method of moving a game from one console to another is by far the most common and successful one. ‘Conversion as Adaptation’ - where the game looks and plays largely like the original but some elements have been deliberately changed to suit the strengths or limitations of the new host console. Ultimately, those which succeed do so by retaining the overall general gameplay whilst overcoming the control disparity between the keyboard, mouse or joystick and the SNES controller. This is the approach Mark Webley and the team at Bullfrog, took when bringing their own game Syndicate to the Snes. Originally a PC and Amiga title, Syndicate is a shockingly dark strategy game set in a world of armed global confrontation between mega corporations, set against a neo-noir backdrop similar in feel and look to Blade Runner. In the future governments and law agencies have had their power evaporated and instead teams of cyborg agents become 'enforcers' acting on the desires of corporations who intend to dominate and control a country or region. Placing the player in the narrative position of overseer rather than direct participant, you are offered direct control of your crew of literal killing machines as they massacre anyone you desire (be it innocent, law enforcing or criminal). Viewed from an isometric view point and echoing the cyberpunk stylings of Shadow Run, Syndicate is not the typical thing you would expect to find on the family friendly Nintendo console. "Nintendo, (who have to approve all games for its systems before they can be released) never had a game quite like Syndicate on its hands before”, project manager Sean Masterson recalls. 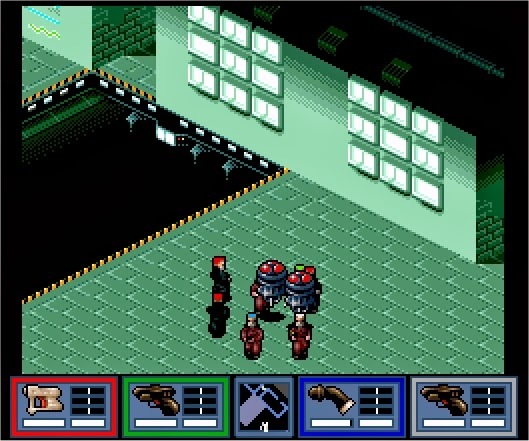 “Missions involve things like assassinations, out right attack on law and order, innocent passers by getting caught up in crossfire, not the kind of subjects that happy and wholesome Mr Ninty thinks of as essential key ingredients.” Evidently, convincing the Japanese gaming giant that this was something suitable for the Snes wasn’t always a smooth process. “Particular words or plots in the mission briefs had to be avoided, also the blood from the PC version would not be acceptable to Nintendo; nor would the flame throwers, never mind the fact they turn civilians into walking barbecue briquettes!" prompted by the Super Nintendo's significantly reduced resolution and perhaps too the need to shift the game more towards fantasy and fun rather than realism. Characters now resemble security guards in Theme Park (which may be intentional given -like Syndicate- that this title was also originally created by Bullfrog Games) your squad of agents have much more cartoon-esque proportions, significantly fatter and less realistic than the original. Coupled with this the environments have lost their original hues, instead a lurid neon palette is used. 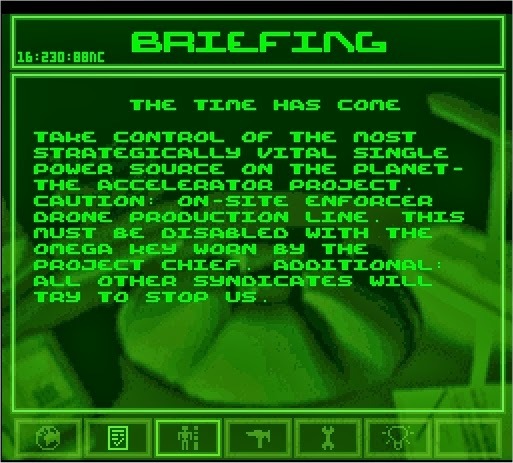 This dramatic new aesthetic does however allow the player to very easily tell what's happening on screen, and unlike the Amiga/PC version (with its tiny sprites), regardless of the manic action you're always aware of where your agents are. 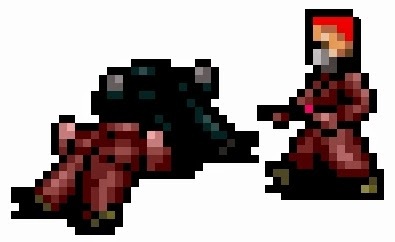 I don’t think it is an inferior look as the sprites are detailed and well drawn; it's just different to the source. As all good adaptations should, the original’s appearance has been moulded and rework to suit the new platform, much like the control scheme, which too is dramatically different to the Amiga game. 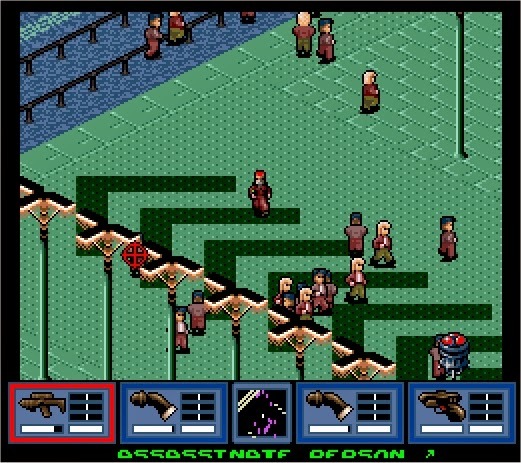 If Cannon Fodder (a similar game originally for the Amiga that involves you guiding a squad of four - shooting at anything that moves) failed on the Snes due to the mouse pointer interface being unwieldy on a controller, Syndicate succeeds by giving you direct control of your agents using the d pad. It feels like you’re playing a console game rather than a computer game that has been shoe horned into an ill fitting platform. That's not to say it’s a perfect control system though, without a keyboard doing some basic actions can become excessively complex. Targets are highlighted automatically when facing them, however this is very hit and miss with non threatening civilians often being targeted rather than enemy agents shooting at you. But the main problem comes with all of the secondary commands which require a series of button presses. Something you do regularly like changing which agent you're controlling for example involves holding Y and cycling though them using left and right buttons. Likewise selecting weapon is equally convoluted, far too slow and fiddly in a fire fight. The default control system sees you controlling all four agents at once but this is not something you would want to stick to. Switching weapons sometimes affects them all and sometimes only the directly controlled agent. Also, only the directly controlled agent will pick up and drop things while whichever agents are following behind will often get stuck behind things, and leave desirable weapons on the ground favouring primary equipment. There may be strength in numbers but there's also a great deal of frustrations by tackling objectives with an entire team. The control system is functional rather than perfect but at least the levels have been designed with the player’s limitations in mind. Steve Caslin (a then freelance programmer) did the bulk of the code, from scratch with the original C source code and a PC version to refer to. 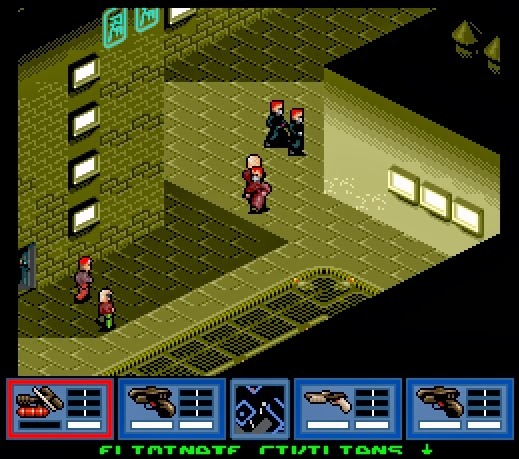 The Snes version of Syndicate was therefore made with the new host platform continually in mind rather than forcing what exists on the PC into a game that doesn't suit it. Each level consists of 2000 8x16 pixel cells, multilayered on the PC but on the Snes made up of just a single background plane and one foreground plane. Any overhead walkways are actually visual illusions and no map totally mirrors the original. Considering the much less precise means of control, walkways are wider and buildings are smaller, though they still far too often block the players view of the characters they intend to control. Masterson talks of rigours bouts of play testing, to ensure each mission remained not only possible to complete but that the process of doing this was fun. However despite all these efforts the game remains littered with bugs that vary from frustrations to near game breaking. Much is made of the ‘Persuadertron’ a futuristic weapon than brainwashes others into following your agent's every whim. Once you persuade people, you have to take them with you to the exit, or else you can't finish the level. This makes perfect sense in a mission where you’re required to recruit a certain individual. It does not make sense on stages where the goal is to eliminate all enemy agents and you’ve only been using the Persuaderton to build up reserve characters to use when your current agents die in the field. To make things worse, if your persuaded person loses sight of your agent they will start to walk around aimlessly. Even though it’s not a mission requirement, you then have to back track through every inch of the map to find the lost soul. In so doing you will no doubt have every finger crossed that they haven't meandered inside a building as not only will this mean you can only see them on the mini map, but it also means you have to go through a door - something that needs to be avoided at all costs. 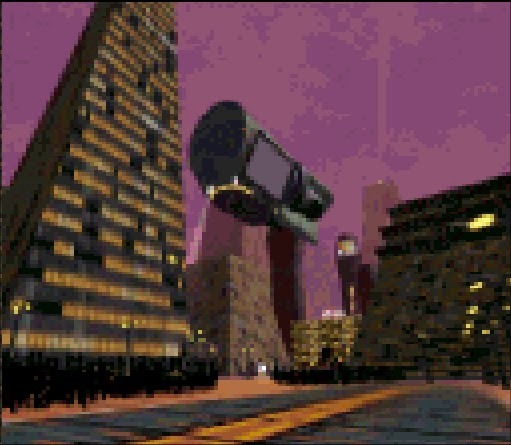 Buildings in Snes Syndicate are infuriating, as they have internal walls. This wouldn't be a problem if the ceiling became transparent when you enter them, but as it remains covered you are guiding your team around blind- again being forced to depend far too much on the basic mini map. If you get caught up on an invisible wall, your only hope for freedom is to randomly walk in all directions. Bizarrely this annoyance is not unique to the Snes version of Syndicate – it existed in the original. “When the player was pushed to do it, and had to go into a room that’s when it became a problem” acknowledges Sean Cooper designer and programmer of the original PC Version. “It was meant to be left as an option, so players that could handle it, could do it. But the ‘Nav system’ [the logic used by the game to move non player controlled characters] couldn’t distinguish between inside and out, so we had to leave it”. 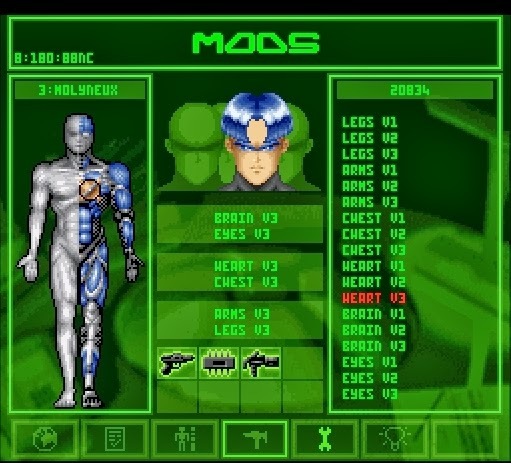 With such a glaring fault in the original it’s surprising it has been carried to the Snes version, particularly when this Nav System is so much weaker and less sophisticated on the console than in the PC big brother. NPC’s on the Super Nintendo’s Syndicate move with a view that the quickest route between two points is a straight line and will always end up getting trapped in buildings or on fences. You quickly learn that though a key part of the game may be persuading the populace to join your gang it's really not something worth doing if not required by the mission briefing. I lost literally hours traipsing round the map looking for a persuaded citizen that I had to have with me to finish the stage, even though I’d only used the persuaderton on a whim. This all changes from annoying to infuriating if you die during the hunt, as it means returning to the mission start. Of course this wouldn’t be as big a concern if you could save mid mission, but alas it seems you can't. In fact you can't save anywhere, all you have are passwords. This seems silly in a game as long, nuanced and complex as this one, but it becomes insanity when the password system isn't sophisticated enough to record a true state of your game. Though it may record your research progression, your completed levels and your money, but everything else is randomised. Your agents reset to no equipment with no upgrades (any money you spent levelling and equipping them is lost) worse still they all have new names. Gone is any sense of affection you may have felt for your killing machines. For example, on my initial play through the game randomly (and brilliantly) decided that my blue haired agent suited the name of the great Peter Molyneux. Imagine my broken heart when my little ruthless cyborg version of the outspoken industry legend vanished, not in hail on gun fire but because he was random assigned the name “Flynn” on a subsequent play. The broken password system also means that while my territory progression was stored, the tax rates I set were not. Having to go through and manually redo up to 50 individual values is a bore, particularly when I found the 'between mission planning segments' confusing and dull in the first place. Things aren’t helped by the a crazy design choice made in the Snes version where all of the command prompts have been replaced with nearly indecipherable icons: a globe, a ticked box, a body, a hammer, a wrench, a light bulb and an arrow (which when listed look a lot like the bizarre bonuses you can pick up in abstract 16 bit platformers). No one should have to do a section of any game with the controller in one hand and the instruction book in the other. It's great for Syndicate to have depth and a degree of strategy and management, but it needs to be presented in a fun accessible way. What this does do though is remind me that the best way to buy Snes games really is boxed and complete. Without a manual to refer to I have no idea how you would know that the only way to start the next mission is to select the "go arrow" after first choosing a territory from a separate world map and confirming the objective on yet another screen. What is nice in the SNES version though are the anime-style portraits, completely with futuristic bizarre haircuts. Evidently the Snes version appears to be the only version of Syndicate released in Japan, so perhaps it is there to make this British game more palatable. In fact bizarrely it's the Snes version (anime faces and all) that was picked to be included in a PSP EA compilation disc, selected even over the original PC and Amiga versions. Considering this portable Playstation has the same controller input device as the Snes, it’s perhaps proof that the best conversions are those that adapt rather than simply emulate. You do have to wonder though how different a game can be before it can no longer bare the originals name. Not only does this Snes version look different, have entirely new levels, enemies and weapons (to please Nintendo the flame thrower is replaced by a less gruesome ice gun) but it also has a superior soundtrack, "better than the PC, due to the Snes'es advance Sony sound chip" insists Masterson. Even so, and despite the title theme being fantastic the music is annoying and repetitive after dozens of hours of play – meaning the game for me was quickly played in mute. Two different level tunes, one for explore and one for danger simply wasn’t enough regardless of how nice they may have sounded on first listen. I liked the game, but after the first 20 or so missions all upgrades will be completed, and there is still 60 percent of the game left. The game tragically gets quite simple quite quickly, with little challenge or variation between stages, despite their varying colour palettes (a quirk not seen in the PC original where every level looked like the British industrial estate where Bullfrog Games was based). Enjoyable as it is, it would have been better shorter. Maybe the game could even be "padded out" with narrative cut scenes between the stages to tell a richer story. Perhaps though, this would be less about converting a game to best work on a new platform and more about converting a game to best suit my taste. The bulk of the back story exists only in the manual however the mission briefings (imaginatively written by Masterson) do allude to a grander narrative going on. Though they always sound far more exciting than the actual stages allow, it’s a shame Masterson’s evident writing talent wasn’t allowed the opportunity to elaborate on the story of EuroCorp’s global takeover more explicitly. Even a page of writing after each stage would have been a nice reward for the player’s efforts. One thing that playing Syndicate did though was reinforce how disappointed I was with the Snes conversion of Cannon Fodder. Highlighting just how much better it could have been were you to have direct control of your team. If anything this was a better conversion of an inferior source game, reinforcement that adaptation surpasses reflection when it comes to bringing home computer games to the Super Nintendo. Where did I get this? Its hard for me to think of Syndicate without recalling Shadow Run, as I got the two games together in a bundle from a Twitter buddy quite a while ago. I had initially dismissed it, foolishly thinking it was a poor conversion, but really it was an enjoyable way to spend quite a considerable amount of time. Buying this on eBay really is about biding you time as I have seen a huge disparity in prices over the months I’ve had it. Sometimes a boxed complete version will change hands for a little over £10, other times people have gone up to £40. Whether you can stick with the game once it becomes monotonous really should dictate how much you spend, and of course make sure you get that manual if you want to know the story or even how to get into your first mission! This is the longest post I've done. Perhaps too long but there was a lot of ideas I wanted to get out. So many ideas in fact that I also wrote about Snes Syndicate on an article for Retro Collect. Have a look there if the above 3000 words wasn't enough! If there was a release in April, I would consider them Gods. [Hinting that you really should] I’m not too fussed about not being able to play some of the games that require an expansion pack. Not really bothered about waiting on Goldeneye alot longer. Just want to get back into the 64 gaming age. Thankyou so much guys for your hard work and effort.